These tumbled marble ornaments are imprinted with our Longoria logo and hang from a tree branch or a bottle of wine with a rustic tie. 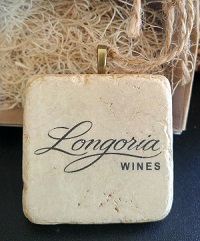 Measuring 2" X 2," they're a must have for your ornament collection or a handsome addition to a gift of Longoria wine. The price of this product varies with the quantity of products ordered in the category "Longoria Merchandise"